No matter how well your enterprise software solution has been configured and installed, the ultimate responsibility for delivering value lies with the people who use it. Learning & People Development are the two key elements for mastering the digital transformation in every company! Join us live on November 15th for a 45-minute free webinar & demo to understand how SAP Education can help you on the digital journey by empowering and educating your employees and discover our new starter pack that will get you up and running in a few days! Join us on Monday, April 30 at 2:00 pm to learn more about how to use SAP Enable Now to create a reliable and well-rounded performance support framework. This kind of framework should be designed to increase the productivity of corporate software users by providing the right knowledge or material at the right moment. In this free 45-minute webinar, SAP will share experiences and lessons learned to overcome initial hurdles and how to plan and design an effective performance support program – either by using the embedded user assistance of SAP applications like SAP S/4HANA or SAP SuccessFactors or by starting from scratch. Learn how SAP Enable Now helps to create multiple different knowledge assets while keeping the efforts for the production and maintenance as low as possible. For more information, please visit the SAP Enable Now InfoCenter: https://enable-now.sap.com. A SuccessFactors transformation is an important opportunity for any organisation – as so many of customers can confirm. As with any transformation it requires attention to the processes, systems and people. Join this webinar to understand how SAP Education supports your people through and beyond your SuccessFactors implementation from your project team members and key HR professional users to your self-service employees. Learning for each one of these stakeholder groups is critical and requires something different. Find out what each group needs and what we offer to support them. From free online learning to innovative virtual live classes and fully customised company specific enablement in multiple languages, this webinar will help you plan your learning approach. Amanda Maguire- Amanda Maguire is a change and education professional with over 20 years’ experience on ERP projects. She is passionate about enabling people and organisations to embrace change and benefit from innovation. As you are considering SAP Enable Now for end-user training content creation, I thought you would be interested in our newly launched service which is designed to accelerate your content development, reduce your risks and successfully meet end-customer requirements. With the New Content Factory Service, SAP offers packaged deliverables, so that you can accurately predict costs and delivery time scales- all for a fixed price. •High-Quality- SAP uses experienced SAP content developers to develop bespoke high-quality content to meet your end-customer requirements. •Certainty – You can accurately predict the costs of developing content and mitigate the risk of overspending with fixed priced contracts. SAP will help you to absorb the delivery risk and assure project success. •Flexibility- CFS allows you to respond to peaks in demand and tight deadlines where you have limited resources. •Consistency- SAP will work with your existing team to ensure the content is consistent with your standard content style and practices. Peter is an SAP Education Solution Principal, providing customers with support, advice and assistance on all aspects of the Education portfolio. With a passion for learning and technology he has gained programme experience as both a learning specialist and SAP financial consultant over the last 12 years. Prior to this, Peter worked as a qualified accountant within a global SAP environment. It takes more than software to transform a business. Your SAP applications are powerful tools, but to harness that power, your workforce must use the software accurately and intelligently. Whether you have a new implementation or solutions already in production, it’s essential to keep skill levels high and knowledge current to increase productivity. Embedded learning provides enablement in the moment of need – with training content provided by SAP as well as your own custom training content. Content Factory Services – fixed-priced packages of transaction-based content production services for user enablement, designed and branded to meet our customers’ needs. During this session our experts will provide insights into today’s user enablement options for SAP cloud software users as well as an outlook and overview to the overall strategy. In addition, you can benefit from system demos as well as a Q&A part. To stay competitive in today's global arena, you need capabilities to create and deploy a multi-channel program that delivers training wherever and whenever employees need it. SAP Learning Hub is the answer: lower your costs and bypass obstacles with instant online access to SAP's vast reservoir of knowledge and learning content. An experienced senior education architect who has worked within the field of SAP Education Solutions for over seventeen years. Responsible for designing and delivering successful education programmes for ERP system implementations at both national and multinational organisations. A qualified Chartered Accountant and fluent in three languages Caroline is able to bring her considerable wealth of business experience to a range of stakeholders and sponsors at many levels within an organisation. With twenty years of experience in project team training and consulting, she is able to engage on multiple levels from the strategic to the practical within a project environment. Caroline's experience covers a multitude of sectors including pharmaceutical, public sector, financial services, utilities, oil and gas, consumer goods and automotive. Specialties: A holistic education approach from cradle to grave; detailed knowledge of Project Team Training and SAP Learning Hub. Caroline Kinsman is an experienced senior education architect who has worked within the field of SAP Education Solutions for over seventeen years. Responsible for designing and delivering successful education programmes for ERP system implementations at both national and multinational organisations. A qualified Chartered Accountant and fluent in three languages Caroline is able to bring her considerable wealth of business experience to a range of stakeholders and sponsors at many levels within an organisation. With twenty years of experience in project team training and consulting, she is able to engage on multiple levels from the strategic to the practical within a project environment. Caroline's experience covers a multitude of sectors including pharmaceutical, public sector, financial services, utilities, oil and gas, consumer goods and automotive. Specialties: A holistic education approach from cradle to grave; detailed knowledge of Project Team Training and SAP Learning Hub. To harness the full power of enterprise software, your users need to rapidly gain fluency with new applications, keep abreast of ongoing changes, and keep improving their skills. As the trend in learning moves from formal learning to informal and time-of-need learning, *SAP Enable Now can support your move to a blended learning approach while providing flexible online performance support. Find out why SAP Enable Now is not just about rapid authoring, and discover the value and power of SAP Enable Now as a collaborative authoring and content management platform for learning and for knowledge sharing. •With SAP Enable Now, formal learning, informal leaning and online performance support is available for any application. •SAP Enable Now efficiently creates rich, interactive and flexible e-learning, process simulations and quiz functionality. •Collaborative authoring, updating, sharing and management of content is key to a successful learning and knowledge sharing strategy. •SAP Enable Now has unique support for SAP’s flagship application suite, SAP S/4 HANA. Join us live on Wednesday, March 7th at 10:00 am for a 45-minute FREE webinar& demo to discover how SAP Learning Hub gives unlimited access to all of SAP’s learning content and certification paths, as well as opportunities for collaboration, social learning and access to live systems in which to practice. SAP Education and the BELUX SAP User Group have collaborated to offer SAP customers a significant discount on an SAP Learning Hub subscription. Join us live on Thursday, January 25th at 10:00 am for a 45-minute FREE webinar& demo to discover how SAP Learning Hub gives unlimited access to all of SAP’s learning content and certification paths, as well as opportunities for collaboration, social learning and access to live systems in which to practice. SAP Education and the UK & Ireland SAP User Group have collaborated to offer SAP customers a significant discount on an SAP Learning Hub subscription. SAP Enable Now/ Workforce Performance Builder Customers, please join us live on Tuesday, December 5th, 2017 to learn how Associated British Ports use SAP Enable Now to develop content and train 2000 people across ports, business areas and SAP solutions. Cristina will share some of the key takeaways including: Using Enable Now for SAP and non-SAP applications, how to drive behavioural change and increase user adoption and will answer your questions. Cristina is an eLearning specialist with 10 years of experience in developing content for K-12 education as well as e-learning to support internal company processes. She has been with Associated British Ports for almost two years and has been using Workforce Performance Builder(WPB) for the past 18 months. During this time she has supported the business in creating training materials for both their SAP and non-SAP applications using WPB and other authoring tools. Please note that this webinar is postponed to October 18th. SAP Education is launching a series of 30 minute live interactive sessions on Wednesdays as from September 13th. You will join thought leaders to find out how your company can benefit from SAP® Education best pratices to enable successful adoption of SAP S/4HANA in support of your transformation goals. 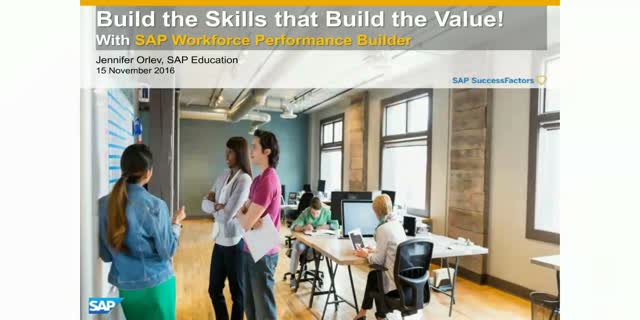 SAP Enable Now/ Workforce Performance Builder Customers- join us live on Thursday, September 7th 2017 to get a detailed look into instructional design, from key messages to change management and powerful interactive content use. Amanda Maguire is a senior education architect with over 20 years' experience on business transformation programmes. With a career focused on the impacts on people – project team members, end users, suppliers and customers, Amanda has a passion for effective and engaging education, enabling people through innovative learning interventions. Her experience is wide ranging - from national to global programmes in a variety of industries. Preparing for GDPR? Are you wondering how you'll track and manage employee compliance? If your answer is yes, join Amanda and Chloe live on July 27th for this 45-minute FREE, educational webinar: 'Using Assessments for GDPR Compliance'. During this webinar, Amanda and Chloe will talk you through the basics of GDPR and show you how to achieve compliance by not only training your people but testing their knowledge so you can prove you’ve taken every step to fulfil the regulation and prevent data breaches. Chloe Mendonca is a Marketing Manager who leads a variety of digital communication campaigns and events across EMEIA. She is particularly fascinated by the way digital technology is changing the world and enjoys helping organisations worldwide realise the power of Questionmark's assessment management system. For the past 5 years, Chloe has worked with businesses across an array of verticals, sharing their stories. Hybris customers, let us introduce you to SAP Learning Hub, which provides flexible and affordable access to a wide range of learning options, giving you a full understanding of SAP solutions, on-demand 24/7. With SAP Learning Hub, you can obtain high-quality learning content enhanced by social learning, peer collaboration and hands-on practice to build up and maintain your SAP skills. Join us live on July 13th for a 45-minute FREE webinar& demo to explore some of the Hybris related content in SAP Learning Hub, and look at the content that is available for the different areas of Hybris: commerce marketing, sales and billing, C4C etc. The session is designed for everyone involved or going to be involved in Hybris implementation programme and those supporting Hybris in support centres or centres of excellence. GDPR – if you haven’t heard of it yet, you soon will. The General Data Protection Regulation (GDPR) (Regulation (EU) 2016/679) is intended to strengthen and unify data protection for all individuals within the European Union and it will apply from 25th May 2018. SAP’s strong offerings in terms of Governance, Risk, Compliance and Security help protect organisations at the level of systems, processes and in-built controls. But what about the people part of the picture? SAP Education offers support for both training your people and, testing them so you can prove you’ve taken every step to fulfil the regulation and prevent compliance breaches. Join us live on June 27th for a 50-minute FREE webinar& demo to find out how SAP Assessment Management by Questionmark can reduce risk and help you comply through thorough and verifiable assessment.